Attachment chain is one of the unsung heroes of the industrial world, being critical to the movement of a diverse range of products along the production line. From the food and beverage sector to pharmaceuticals, and from packaging to automotive parts production, attachment chain is critical to the efficiency and reliability of the production line. Selecting from a range of standard and custom attachments allows the chain to be customised to the precise needs of the conveying application. With regard to maintenance or overhaul of attachment chain, factors such as installation time, maintenance activities and the shorter lifespan of a budget chain all impact on total cost of ownership, quickly adding up to significantly increased MRO costs. With its history of innovation, Tsubaki's argument has always been that attachment chain should be regarded as much more than a commodity product, with a correctly specified and well engineered attachment chain solution adding value to the conveying application. The characteristics of the conveyed materials and the working environment are different for each application. Because Tsubaki's attachment chain is available with the same added value and solution providing features as its drive chain, engineers have the freedom to build tailored systems that precisely meet the needs of the application. For example, the food industry typically requires corrosion resistant parts, which can be provided by the Tsubaki Neptune series for carbon steel chains, or fully stainless steel chains and attachments where required. Where a maintenance-free solution is important, Tsubaki's Lambda range is also available with a wide range of attachments, eliminating the need for re-lubrication and contamination risks to finished products. Attachments are available for both single and double pitch chains. The A attachment is the most commonly used, having a folded link plate that extends out on one side of the chain, forming an L shape. When A attachments are installed on both sides of the chain, they form a K attachment. Slats or jigs can then be installed over the chain. Consideration should be given to the attachment interval, the width and rigidity of the slats, Tsubaki offer a full technical support service, that can help select the best chain for the application. Variants of the A and K attachments are the SA and SK, where the link plate is extended. The D attachment is an extended chain pin where components such as trays, cross bars, and other fittings can be connected to the chain to convey products. The extended pins are subjected to bending and shearing forces. With the GK-1 attachments, a hole is added to the centre of both link plates, enabling fittings to be attached between two (or more) parallel chains. This type of attachment is often used when cross rods with larger diameters than the maximum applicable diameters of a hollow pin chains are used. For single pitch chains, many of these attachments are also available with W designations, where the width is equal to the width of the link plate. Tsubaki stocks an extended range of standard components and offers a build to order service. As a leading innovator in attachment chain, when starting with a completely new design Tsubaki can tailor make an attachment chain in any specification, including custom manufactured attachments. Special designs might include specific dimensions, such as non-standard assembly holes. 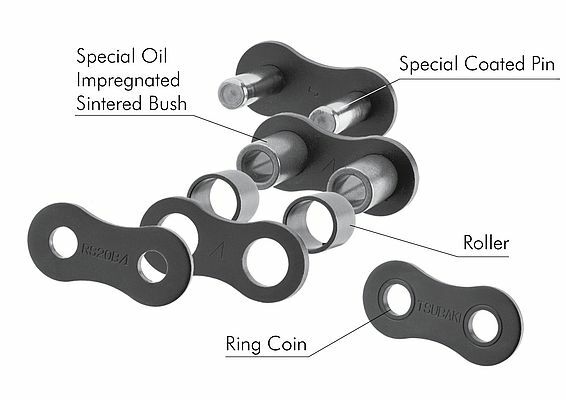 Further, in addition to its standard attachment chain, Tsubaki has recognised the individual requirements of different applications with a number of specialty attachment chain options. For example, there are specially tailored chains for applications such as can processing and book binding. The packaging sector can take advantage of flat-topped chain, thermoforming gripper chain or special extended pins. For tray packing applications in the beverage industry where machines require pushers to be fitted to the transport chain, Tsubaki has developed a bespoke solution in which the attachments are mounted by an engineered extended pin whilst bringing lubrication free advantages, reducing wear and contamination.